Brazil’s Robert Scheidt and Henry Boening top the leaderboard after the first day of racing at the Star Sailors League Final in Nassau, Bahamas. Scheidt and Boening (1,17,3,2) opened their series with a win and finished the day with six points, two points ahead of Mark Mendelblatt and Brian Fatih (6,4,1,3) who took a win in race 3. In third place are Diego Negri and Frithjof Kleen (3,5,5,20) on 13 points and two points ahed of fourth placed Augie Diaz and Bruno Prada (8,7,7,1) who took a win in the windy race 4. The other winners of the day were Lars Grael and Samuel Gonçalves (16,1,19,8) taking race 3 and sitting in eighth place overall. 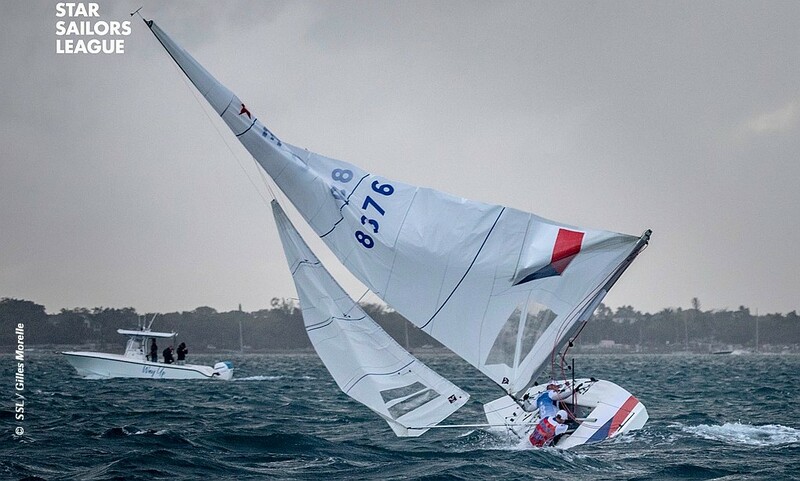 The day started in perfect racing conditions, but in the final race of the day, race 4, saw the arrival of the breeze, with a right-hand shift that caused some carnage – Hamish Pepper and Steve Mitchell lost their mast. The aim at this stage is to finish the qualifying races in the top ten to get into the knock-out series races.